An F/A-18F Super Hornet is seen above Iraq during a mission on Operation OKRA. Image via Commonwealth of Australia, Department of Defence. Two Royal Australian Air Force Super Hornets have flown their final missions in their air strike operations in Iraq. 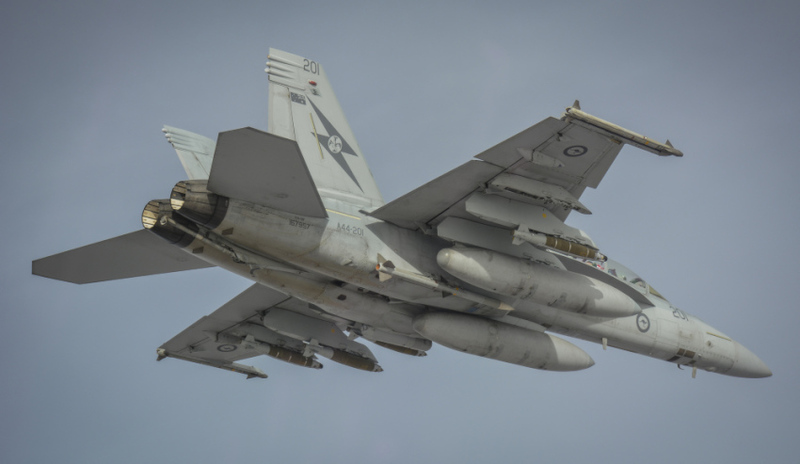 The Australian F/A-18 Hornets have conducted continuous operations in Iraq since their first mission in October 2014, flying more than 2,700 sorties and over 21,000 flying hours. Operating within a US-led global coalition, and at the invitation of the Iraqi government, Chief of Defence Force Air Chief Marshal Mark Binskin said the RAAF had made a significant contribution to the fight against Daesh. "Over more than three years, hundreds of ADF personnel have deployed to the Middle East as part of the ATG strike element. With each deployment, they have demonstrated the highest levels of skill, courage and professionalism," ACM Binskin said. "Our aircrew and their support crews have consistently delivered in extremely difficult and challenging conditions. "The Air Strike Group and their families can be proud of their achievements and their important contribution to help the Iraqi Security Forces liberate their country from Daesh." While the 14 January flight marked the completion of Australian strike missions in the Middle East, the ATG will continue to support the coalition air campaign in Iraq and Syria. An RAAF KC-30 air-to-air refuelling aircraft and an E7-A Wedgetail Airborne Early Warning and Control aircraft and the associated aircrew, maintenance and logistics personnel will continue to deploy under Operation OKRA. "The ADF will continue to work with our coalition and Iraqi partners over the coming months to establish their ongoing requirements and assess where they can make the most valuable contribution, as we work to maintain the gains in that region," ACM Binskin said. "ADF personnel attached to the Special Operations Task Group and the Task Group Taji training mission continue to provide an extremely valuable contribution in the ongoing fight against terrorism." Operation OKRA is the ADF’s contribution to the coalition effort to combat the Daesh threat in Iraq and Syria.